Music has become one of the most important components of worship at St. Barts.With the support of our wonderful mechanical-action pipe organ a dedicated group of more than 20 singers in 4-part harmony forms the choral backbone of all our music making here at St. Barts. We sing music from a wide range of periods and styles, but always to the best of our ability and with a deep sense of commitment to quality in worship. We hope that our endeavors aid and add to the meaning of each listener’s faith journey. It is not necessary to be a member of St. Barts, or even an Episcopalian to join us in this work. In addition to Sundays, we regularly schedule small concerts, evensongs and other fun, musically-based events. John Corrie has been at St Bart’s since 2014. He has been Artistic Director of the Maine Music Society since 2006. He holds degrees from Oberlin Conservatory of Music, Northwestern University School of Music and Yale University School of Music. A Fulbright-Hays Scholar, Mr. Corrie studied organ and harpsichord at the Hochschule fur Musik in Vienna, Austria, in 1972-1973. Mr. Corrie has been teaching at Bates College since 1982 where he is a Lecturer in Music. He has been the College Choir Director since 1986. Along with his responsibilities in the Music Department, Mr. Corrie has been teaching private voice lessons since 1991 as well as private lessons on organ, harpsichord and piano. Mr. Corrie was appointed organist at the Bates College Chapel in January of 2005. Mr. Corrie served as organist and choir director at the Church of Ste. Mary the Virgin, Falmouth, Maine, for 25 years from 1982 to 2007. Mr. Corrie was named Artistic Director for the Maine Music Society based in Lewiston-Auburn, Maine, beginning July 2006. He continues with the responsibilities of this work conducting the Androscoggin Chorale and the Maine Music Society Chamber Orchestra. Mr. Corrie has been a member of the Maine Chapter of the National Association of Teachers of Singing since 1995. Mr. Corrie has served as President of the State of Maine Chapter of the National Association of Teachers of Singing from 2007-2012, and has served as the New England Regional Governor for the State of Maine for the National Association of Teachers of Singing from 2008-2012. We are very fortunate to have a fine 19-rank, all mechanical pipe organ which supports both congregational and choral singing and inspires through concerts and solo work in the festivals and services of the Episcopal liturgy. 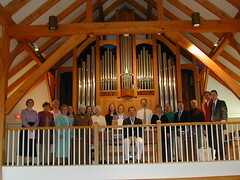 Our organ was built and installed by the Andover Organ Co. in 2001. It is hand-crafted of fumed red oak and walnut and contains nearly one thousand speaking pipes on two manual and one pedal divisions. 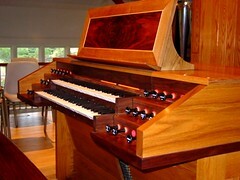 The console is detached from the organ to accommodate direction from the keyboard, but all action is controlled manually without the assistance or interference of electricity. The fan blower is the only electrically operated part of this instrument. See detailed organ info in right hand column.